The NOW: Holy cow. 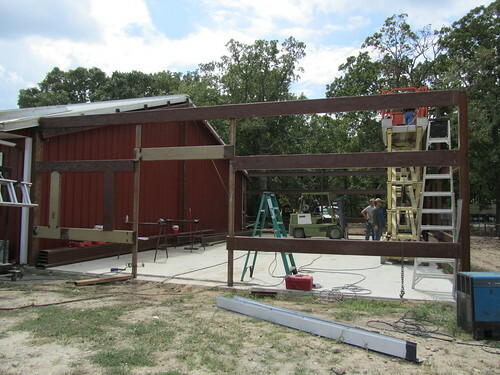 Are you aware that The Primitique represents at Zapp Hall in Warrenton starting Friday? Oh, my goodness. Wanna know what is in the Bulldog trailer? So do I! We packed up the Bulldog Father's Day weekend, when we closed Primitiques. The new store, The Primitique, hasn't opened yet. So, I guess you could say you will be seeing my entire store under that 20x20 tent at Zapp Hall! Of course, I threw some really great stuff on top of the really great stuff in the trailer. I tell ya, it will be like unwrapping Christmas gifts as we unpack the trailer! The FUTURE: Speaking of The Primitique. Check this out. Indeed, we've got walls! It would seem that someone has gotten busy. Maybe it was the threat of me throwing an old truck on the pad and having them build around it? ha! I will let you know of a Grand Opening date when there's a roof and stuff. K? The FREE STUFF. Did you know that Robelyn is having a give away? Seriously. 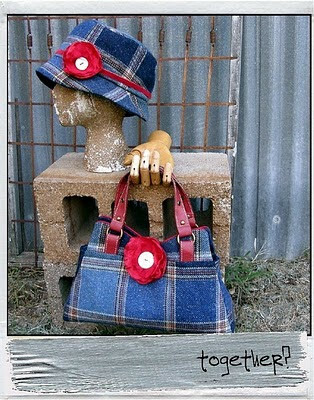 She wants to know if you would wear this darling hat and pocketbook together, at the same time. I said yes. She said no. Bless her heart, it would seem she is outnumbered so far. Click here to check it out and vote. Did I mention she'll be sharing space with me at Zapp? Uh huh. Come see us! Now, to occupy your time until I can get to a computer in the middle of the pasture and post again, click below and view the pics from our previous shows. This, being my third show, is the most exciting. Because, remember? I have no idea what I have!!! Oh! For those who are coming to the show, you better come by and say howdy. I'd love to say hi and share a hug with ya! I'll be by Saturday. That'll be my third time to see you at Zapp, so that'll be your third hug! I'll be riding in a cloud of dust early! That looks like a pretty big door opening. I imagine we can get a lot of cool stuff in there! Looking forward to sharing some tent time with you and Robelyn! Mindy, you're going to have so much fun back at Zapp Hall I can't stand it! Can't wait to see photos of your space!!! Maggie and I are so sad we couldn't come this time but we are trying to put our best foot forward for the October show in Canton. Knock-em dead at Zapp. Good luck on your new store.